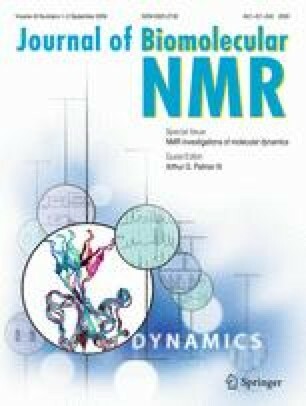 Chemical shift anisotropy (CSA) tensor parameters have been determined for the protonated carbons of the purine bases in an RNA kissing complex in solution by extending the model-independent approach [Fushman, D., Cowburn, D. (1998) J. Am. Chem. Soc. 120, 7109–7110]. A strategy for determining CSA tensor parameters of heteronuclei in isolated X–H two-spin systems (X = 13C or 15N) in molecules undergoing anisotropic rotational diffusion is presented. The original method relies on the fact that the ratio κ2=R 2 auto /R 2 cross of the transverse auto- and cross-correlated relaxation rates involving the X CSA and the X–H dipolar interaction is independent of parameters related to molecular motion, provided rotational diffusion is isotropic. However, if the overall motion is anisotropic κ2 depends on the anisotropy D ||/D ⊥ of rotational diffusion. In this paper, the field dependence of both κ2 and its longitudinal counterpart κ1=R 1 auto /R 1 cross are determined. For anisotropic rotational diffusion, our calculations show that the average κav = 1/2 (κ1+κ2), of the ratios is largely independent of the anisotropy parameter D ||/D ⊥. The field dependence of the average ratio κav may thus be utilized to determine CSA tensor parameters by a generalized model-independent approach in the case of molecules with an overall motion described by an axially symmetric rotational diffusion tensor.